Where Else in the Wild? This book is s sequel to Where in the Wild? 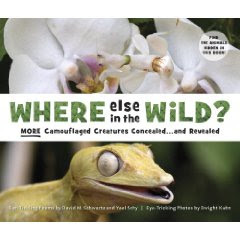 In this book you'll find "Ear-tickling poems" by David M. Schwarts and Yael Schy" and "Eye-Tricking Photos by Dwight Kuhn." When you open the book you are met with a picture of a bunch of seaweed. Or is it just seaweed? Somewhere in there is a little green crab that you are encouraged to find. But if you run into some trouble and can't quite find the creature, if you flip to the back of the book you'll find a hint. Most pages, however, consist of a hidden animal. If you want a tip, then you can just open up the page spread and the animal will be pointed out to you. The photographs are very clever and, of course, getting to lift up pages to discover the answer is a treat. Very well done and definitely engaging. That sounds great, my boys and Z would definitely love those books!